No Nikon D800 in your bag? No Leica D-Lux portable in your pocket? 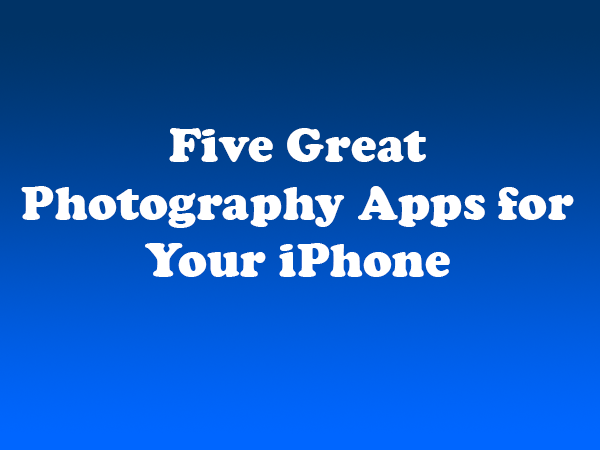 Every cell phone has a camera and a number of great photography apps to go along with it. So use it! Once you have trained yourself to see the world around you as a stream of infinite artistic images just waiting for your camera to capture, don’t worry that you left your camera behind. It is always better to capture the image rather than lose an opportunity, and the iPhone is not a bad last resort. Apple has done a fairly remarkable job with the camera in the iPhone. Some say that the iPhone camera is better than most fixed lens portable cameras from a decade ago. In addition, software developers are continuously creating new apps that can improve everything from image quality to photo editing capability. Manual: As the name suggests, the app gives the user granular control over several key settings found on a traditional camera, including ISO, manual focus, white balance, and shutter speed. Being able to control these settings is essential when taking pictures in challenging lighting conditions or when attempting to capture objects moving at fast speeds. Afterlight: Offering an array of filters and textures, this app is one of the highest-rated editing tools for the iPhone. The app boasts 15 adjustment tools, 74 filters and 78 textures. You can also crop and straighten images as well as apply frames all within the app. The best part — it’s also easy to use. SKRWT: Images taken with cellphones often look rounded due to their wide-angle lenses. This app fixes the problem by squaring up the image and removing the distortion. It also allows users to correct the perspective for shots that were not taken head-on. TouchRetouch: This extremely useful app only does one thing, but it does it very well. It allows you to remove unwanted content or objects from your photos, by simply using your finger. For instance, you can easily remove the beachgoers that wandered into your sunset photo or the glare from the streetlight that ruined your nightscape. As the app points out, it is also fun to make it look like people are flying, jumping or posed oddly, by removing whatever was supporting them. Instagram: The most popular photo app is also free. While other apps may offer a wider range of filters and editing options, Instagram is quickly becoming the most widely used platforms for sharing photos. With more than 300 million users, you can shares photos with your friends and family and also check out images posted by people (famous and not) from around the world. For professional photographers, there are a host of apps that make your iPhone even more valuable. From model release forms to online portfolios, there’s truly an app for that.